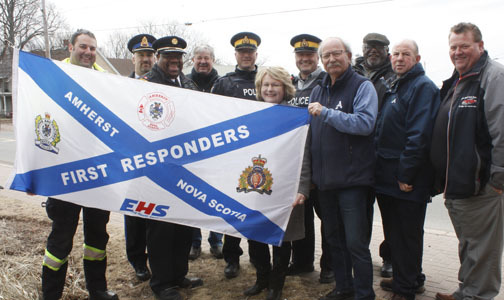 Just how important and dangerous the role of a First Responder is was demonstrated in Moncton in 2014 in the deaths of RCMP constables Doug Larche, Fabrice Gevaudan and Dave Ross, the death of Const. Frank Deschenes in 2017, the shootings last summer of two police officers and two citizens in Fredericton and the recent death of Truro Firefighter Skyler Blackie. The Moncton incident hit especially close to home because as a member of the Moncton Hospital’s management team he was present when a Code Orange was called and surgical teams were mobilized, the mayor said. The families of First Responders must also be thanked, the mayor said. Kogon then read a proclamation declaring April 8 to April 14 as First Responders Week in the Town of Amherst before presenting copies of the proclamation and a coin marking the occasion to the representatives of the four organizations – Amherst Police Chief Dwayne Pike, Amherst Fire Department Chief Greg Jones, Sgt. Dave Lilly and Cpl. Dave Baldwin of Cumberland RCMP and EHS Paramedic Jamie MacKinnon. The coin will also be given to every member of the four First Responder groups. The mayor was then joined by the First Responder representatives and members of council in raising a flag that commemorates their service and sacrifices. First Responders Week also includes an open house at the Amherst firehall on Thursday, April 11, from 4 p.m. to 7 p.m. featuring displays from all four groups. There will also be a parade and church service on Sunday, April 14, beginning at 1:30 p.m. The public is encouraged to attend both events.